After rumblings of the new project from GAYNGS member and Roma di Luna darling Channy Moon Casselle hit Twitter back on August 12, we've been waiting to hear more. We now know the project's name, Polica, but otherwise, details are still sparse - all we know is that Channey was accompanied by producer Ryan Olson and Solid Gold's Zach Coulter in Austin, Texas, at Spoon drummer Jim Eno's studio earlier this month. Finally on Monday night, the first track, "Lay Your Cards Out," hit the net. The song features Channy's ethereal vocals, a smooth, chilled-out vibe, and accompaniment by Bon Iver's Mike Noyce. 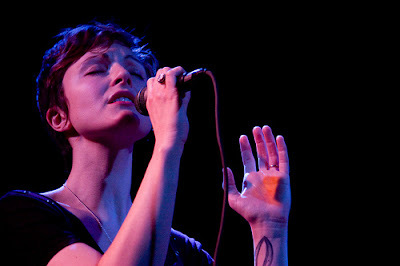 Listen at www.thisispolica, and follow @thisispolica and Policia's Facebook page for updates. UPDATE: Gimme Noise has additional details about a project, including the band's debut performance this Sunday at Nick and Eddie. channy's name is spelled CHANNY. also, polica features chris bierden of vampire hands on bass & drew christopherson and ben ivascu on drums.